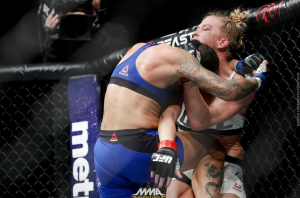 UFC 208’s main event was a 5 round slug fest leaving Holly Holm bloodied and bruised and Germaine de Randamie as the first UFC women’s featherweight champion but not without more controversy! De Randamie’s unanimous decision victory over Holly Holm at Brooklyn’s Barclays Center was marred by several illegal blows after the bell in rounds two and three in what was considered by many as poor officiating by referee Todd Anderson. Anderson failed to give De Randamie a warning after she clocked Holm with two huge punches well after the horn sounded in the second round. In the post fight interview, Holm stated that it was the hardest punch she felt all night from GDR and thought it was intentional especially since it happened again in the third round when De Randamie exploded unfazed with late strikes after a head kick. However, De Randamie claimed during her in-cage interview that she didn’t do it on purpose, that she was in the moment, but Holm wasn’t buying it. Holm stated that she would like a rematch and could likely get it. Watch Germaine de Randamie vs. Holly Holm full fight video highlights from UFC 208’s main event above, courtesy of FOX Sports 1. De Randamie who was not at the post fight interview, suggested she’s going to take time off to repair ligament damage to her thumb before returning to action. Given the controversy its unclear who will be her next contender, Cris “Cyborg” Justino’s USADA-related case still has to be cleared up so a Holm rematch is possible.